Moreri. —Niceron, vol. XXIII. Frehcri Thealrum. D‘Urfey (Thomas), an author, more generally spoken of by the familiar name of Tom, was descended from an ancient family in France. His parents, being protestants, fled from Rochelle before it was besieged by Lewis XIII. in 1628, and settled at Exeter, where this their son was born, but in what year is uncertain. He was originally bred to the law; but soon finding that profession too saturnine for his volatile and lively genius, he quitted it, to become a devotee of the muses; in which he met with no small success. 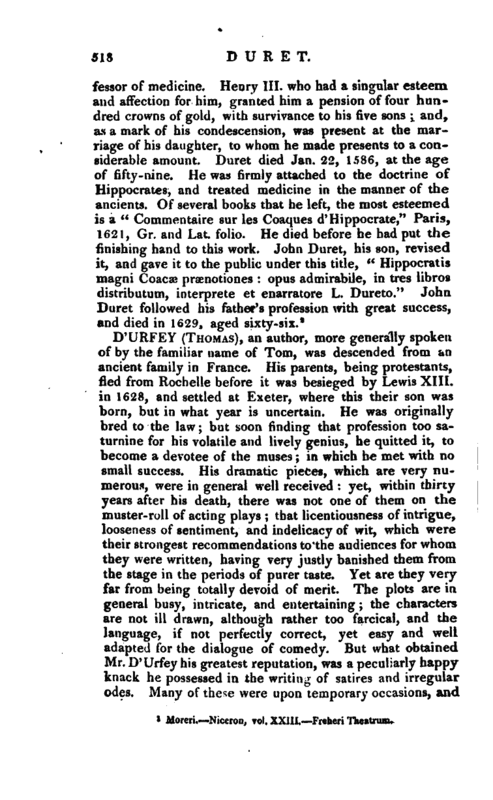 His dramatic pieces, which are very numerous, were in general well received: yet, within thirty years after his death, there was not one of them on the muster-roll of acting plays; that licentiousness of intrigue, looseness of sentiment, and indelicacy of wit, which were their strongest recommendations to the audiences for whom they were written, having very justly banished them from the stage in the periods of purer taste. Yet are they very far from being totally devoid of merit. The plots are in general busy, intricate, and entertaining; the characters are not ill drawn, although rather too farcical, and the language, if not perfectly correct, yet easy and well adapted for the dialogue of comedy. But what obtained Mr. D’Urfey his greatest reputation, was a peculiarly happy knack he possessed in the writing of satires and irregular odes. Many of these were upon temporary occasions, and | were of no little service to the party in whose cause he wrote; which, together with his natural vivacity and good humour, obtained him the favour of great numbers of all ranks and conditions, monarchs themselves not excluded. He was strongly attached to the tory interest, and in the latter part of queen Anne’s reign had frequently the honour of diverting that princess with witty catches and songs of humour, suited to the spirit of the times, written by himself, and which he sung in a lively and entertaining manner. And the author of the Guardian, who, in No. 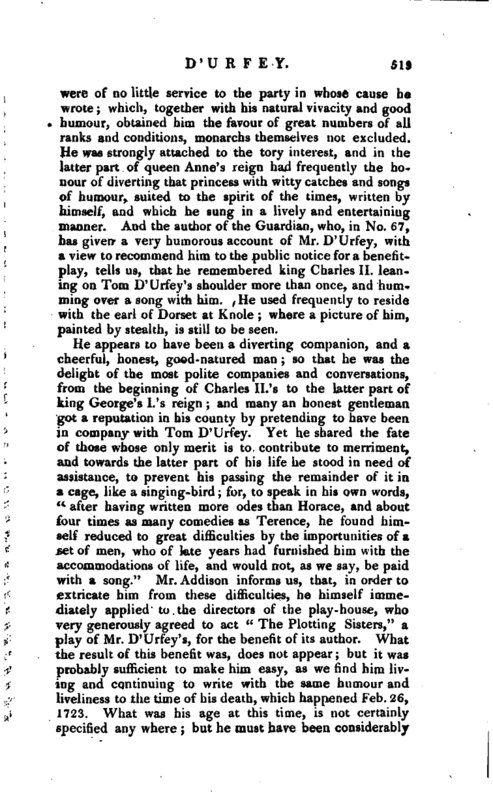 67, has given a very humorous account of Mr. D‘Urfey, with a view to recommend him to the public notice for a benefitplay, tells us, that he remembered king Charles II. leaning on Tom D’Urfey’s shoulder more than once, and humming over a song with him. He used frequently to reside with the earl of Dorset at Knole; where a picture of him, painted by stealth, is still to be seen. He appears to have been a diverting companion, and a cheerful, honest, good-natured man; so that he was the delight of the most polite companies and conversations, from the beginning of Charles II.‘s to the latter part of king George’s I.’s reign; and many an honest gentleman got a reputation in his county by pretending to have been in company with Tom D’Urfey. Yet he shared the fate of those whose only merit is to contribute to merriment, and towards the latter part of his life he stood in need of assistance, to prevent his passing the remainder of it in a cage, like a singing-bird for, to speak in his own words, “after having written more odes than Horace, and about four times as many comedies as Terence, he found himself reduced to great difficulties by the importunities of a set of men, who of late years had furnished him v\ith the accommodations of life, and would not, as we say, be paid with a song.” Mr. Addison informs us, that, in order to extricate him from these difficulties, he himself immediately applied to the directors of the play-house, who very generously agreed to act “The Plotting Sisters,” a play of Mr. D’Urfey’s, for the benefit of its author. What the result of this benefit was, does not appear; but it was probably sufficient to make him easy, as we find him living and continuing to write with the same humour and liveliness to the time of his death, which happened Feb. 26, 1723. What was his age at this time, is not certainly specified any where; but he must have been considerably | advanced in life, his first play, which could scarcely have been written before he was twenty years of age, having made its appearance forty-seven years before. He was buried in the church-yard of St. James’s, Westminster. Biog. 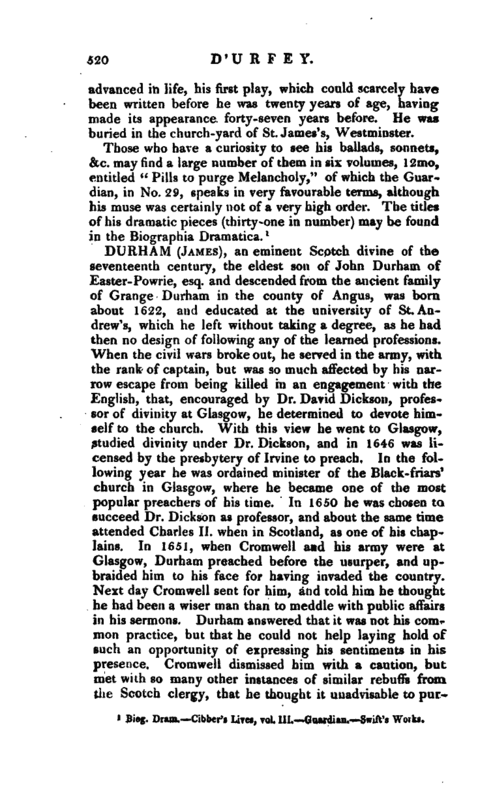 Dram.—Cibber’s Lives, vol. 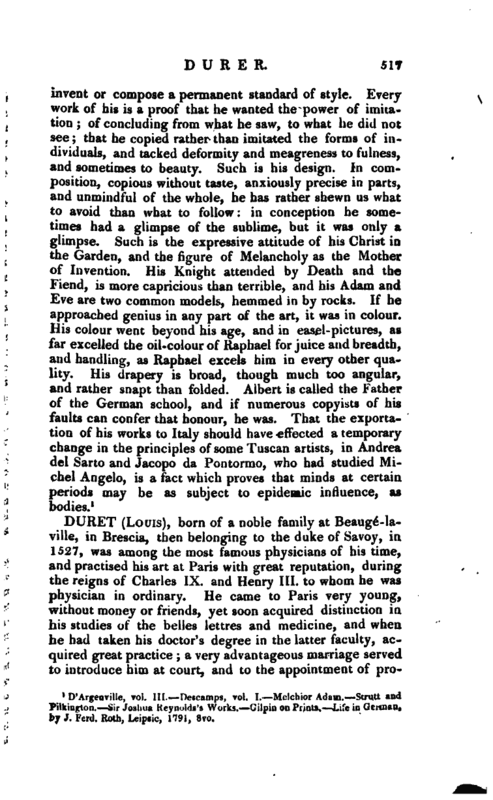 III.—Guardian.—Swift’s Works.